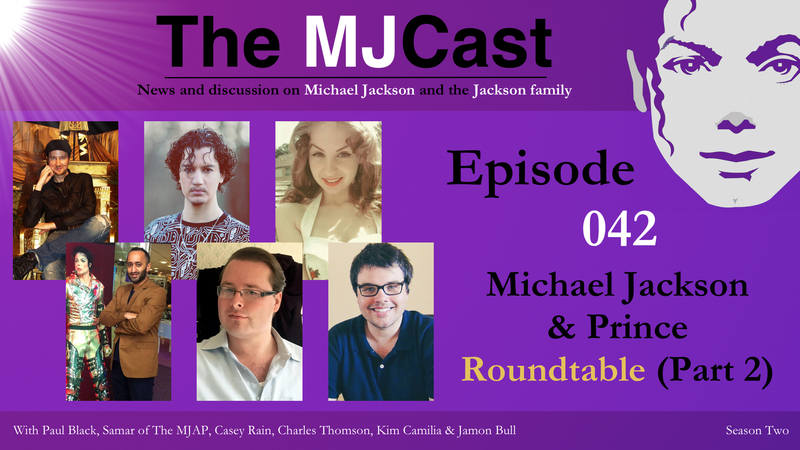 Welcome to part two of our Michael Jackson & Prince roundtable discussion, a new format for The MJCast which a panel of expert participants discuss a particular topic in depth. For this second and concluding episode, returning guest Paul Black continues moderating our discussion around the two legendary entertainers, Prince and Michael Jackson. Participants again include Samar of The Michael Jackson Academia Project, Casey Rain and Kim Camilia of The Violet Reality, Charles Thomson, Jamon Bull of The MJCast and of course, Paul Black. Beginning with an exploration into the participants personal experiences with Michael Jackson and Prince, Paul then leads us in a comparative discussion around the unfortunate deaths of both artists, their commitment to challenging expectations in a corrupt entertainment industry and finally their impacts on culture, style and fashion. The Violet Reality on Facebook, Twitter, Instagram and YouTube. This entry was posted in Specials, The MJCast, Uncategorised and tagged Casey Rain, Charles Thomson, Do You Know Where Your Children Are?, Human Nature, Jamon Bull, Kim Camilia, Michael Jackson, Paul Black, Prince, Roundtable, Samar, The Michael Jackson Academia Project, The Violet Reality by Jamon Bull (Admin). Bookmark the permalink.